Price? (inc Thunderbolt cable): US$189+shipping AKiTiO Thunder2 for DIY eGPU users from sales@akitio.com. Details in spoiler . . .
- Estimated shipping quotes for you for the following country but prices vary upon region within the country as well. - Asian customers will have their shipped from AKiTiO's Taiwan office and that should lower the shipping costs quite a bit. 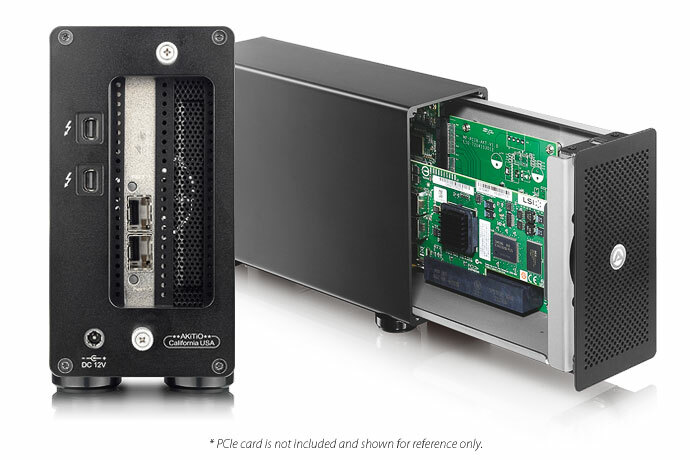 The portable Thunderbolt™ 2 PCIe expansion box provides an additional PCIe slot for systems that do not support or have enough available space for expansion cards. The external Thunderbolt 2 connection allows you to daisy-chain up to 5 additional Thunderbolt devices, making this the ideal plug and play companion especially when you have to take your system with you. Replacing the card is a simple matter of removing three hand tightening screws, so no tools are required. 172mm 1178Mhz Inno3D GTX970 4GB - would fit perfectly! Although the device is advertised as Thunderbolt 2, the specs indicate that the device is limited to only 5Gbps, which is only have the performance of Thunderbolt 1. So I think you're better off bying a Sonnet Echo Express with e BPlus adapter or something similar. The advertising is correct - "PCI Express 2.0 compliant interface at 5.0Gbps" refers to a Gen2 single lane. 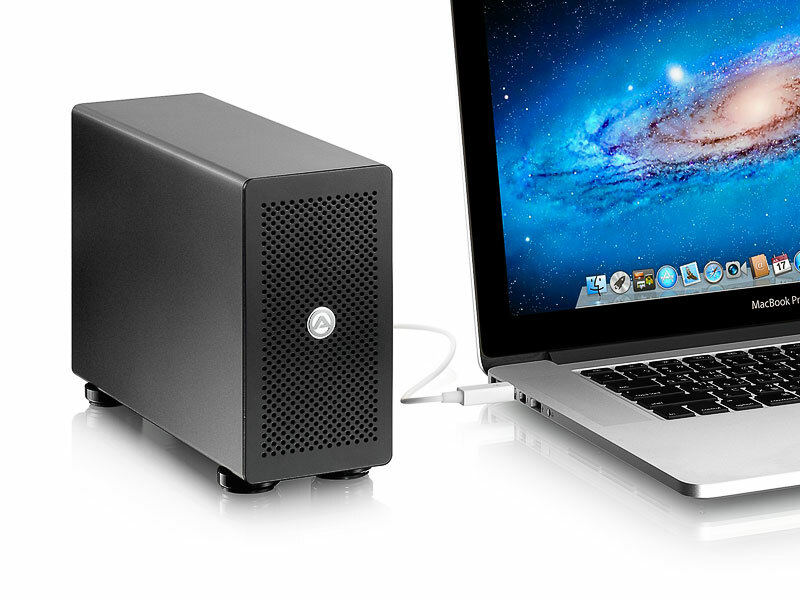 The Akitio device is truly a Thunderbolt 2 product. B&H listing it at US$201, REF: Akitio THUNDER2PCIe BOX AK-T2PC-TIA B&H Photo Video . Meaning it price matches the US$199 Firmtek Thundertek Thunderbolt enclosure for value but gives Thunderbolt2 performance when attached to Thunderbolt2 notebooks. That makes it the best value Thunderbolt enclosure that can be adapted for eGPU use. Ah, ok. I misinterpreted that. Sorry for the confusion! That makes it a very interesting product then, indeed. I'm going to keep that on my watchlist. The PCIe (x16) slot accepts half-length, full-height, double-width cards and provides a maximum of 25W. Let's hope that the 25W power limit can be overcome by changing the supply adapter to another with higher A. Do you think the Akitio Thunder2 PCIe Box can supply the 75W needed by the graphics card? The specs stated a maximum of 25W. It says maximum 25W, yet provides a 12V/5A DC PSU (60W). Is it fused? Go figure. "Supports half-length, full-height and double-width cards" makes me wonder, can it support a full length card without the chassis lid on? It does have a x16 slot. I have placed an order for the Akitio Thunder2 PCIe Box. It will take a while before I get it since it is going through a forwarder. I received a notice saying that the Akitio Thunder2 PCIe Box has been shipped from the supplier so stocks are already available. The Firmtek Thundertek will double bandwidth. This will certainly improve performance as can be seen at http://forum.techinferno.com/diy-e-gpu-projects/3062-%5Bguide%5D-2012-13-mbp-gtx660ti-hd7870%40x2-2-th05.html#post42483 . However, I recommend you consider the Akitio adapter for the same price instead: http://forum.techinferno.com/diy-e-gpu-projects/6858-%5Bguide%5D-14-asus-g46vw-gtx670%4010gbps-tb1-thundertek-3d-enclosure-5.html#post98210 . It has a TB2 chip on it. Meaning, you'd have the option of upgrading from your 2012 MBA to a 2013 13/15" rMBP to increase bandwidth again from 10Gbps to 16Gbps. 2. This Thunderbolt product is NOT compatible with Apple's Boot Camp. Does this mean that it does not "officially" support OR some hack is required to make it into eGPU host? This means they are not going to help you to get it going. It doesn't mean it's technically not capable of being used for an eGPU. We've got plenty of examples of TB enclosures being more than capable of hosting an eGPU: http://forum.techinferno.com/diy-e-gpu-projects/6578-implementations-thunderbolt-expresscard-mpcie-egpus.html#Thunderbolt . Most of those are not plug'n'play. It means they are towing the Intel line of "not supported for video cards". One more Q - Being a TB2 technology, will this work for TB1? Meaning my MBA will max out the thunderbolt bandwidth it has? Looks like a fantastic products but I'm afraid that even a GTX 750 Ti will not fit (length should be good but height is probably a problem because of the PCIe power cable that you need to add). Most of the GTX 750 Ti cards do not require additional power from the PCIe power cable. The MSRP for the Thunder2 PCIe Box is $269.99. It comes with a thunderbolt cable though. Yes but the GTX 750 Ti normaly needs 75 Watt from the PCIe slot. But this device has apperently only a 60 Watt PSU to power the Thunderbolt hardware and the PCIe slot. Time will telll I guess. But even if you add a PCIe extender cable with molex connector for power you propably would still be able to fit a low profile GTX 750 Ti inside the chasis. I am wondering why does PCIe slot in the card requires power? The graphics card itself is powered by 6/8 pins from the PSU, but I have seen 16x risers with Molex power too! According to the specs of the Akitio Thunder2PCIe Box, the slot only provides 25Watt of power. A normal PCIe slot, on say a traditional motherboard with CPU, delivers 75watt of base power. So to fully power a GFX card in the Akitio, an additional power source should be connected to the PCIe slot: the molex connector. I doubt that delivering that extra 50 watt through the 6pin and 8pin connectors instead of the molex will work. Been following this thread and am very interested to see this used for an eGPU. In case people are interested it's listed on Amazon for $199. Yes I also found it om Amazon America (link) but I couldn’t find this product on the website of the different European approved stores. So I've send them an email to know when the Akitio Thunder2 be available in Europe. Hopefully the price will be acceptable because Sonnet for instance asks 40% more for their products in Europe (maybe it is because of higher VAT and import taxes). Yes I also found it om Amazon America but I couldn’t find this product on the website of the different European approved stores. So I've send them an email to know when the Akitio Thunder2 be available in Europe. Hopefully the price will be acceptable because Sonnet for instance asks 40% more for their products in Europe (maybe it is because of higher VAT and import taxes). I've ordered something off of the UK amazon store without issue before and I'm in the US. If I remember correctly, they charged me more for shipping. The negative was if I needed a return or exchange, that money would come out of my pocket and be rather expensive. I don't know if it works both ways, but could be an option for you. I'd actually be interested in seeing how easily you could remove the board from the chassis and put it into a small ITX case that would support a full size ATX PSU and most modern GPUs. And it would also look a lot cleaner than leaving it lying around. I was considering this ITX case. 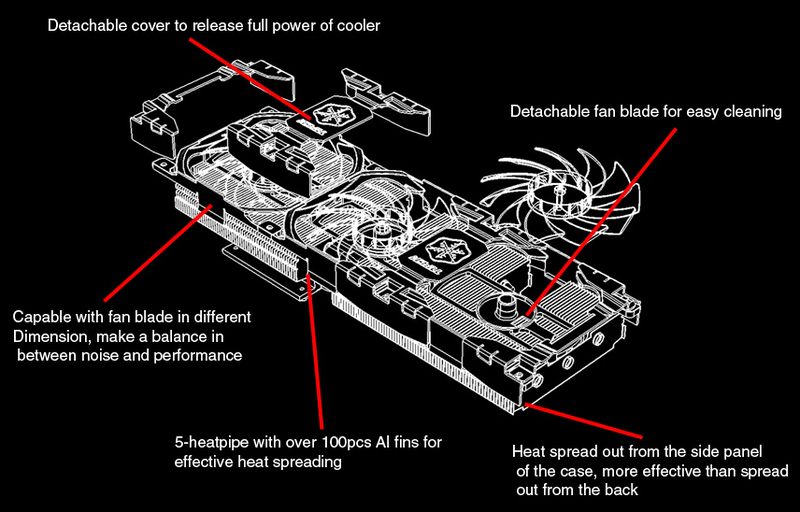 It fits full-size graphics cards up to 343mm/13.5 inches in length and has a nice cooling system. Wondering if maybe the power button can be wired to the PSU, but if not could just use the paperclip method and use a PSU with a switch. It's also nice to see there is a dedicated grommet for wiring. For $45 bucks seems like a nice way to clean up a setup. I'd actually be interested in seeing how easily you could remove the board from the chassis and put it into a small ITX case that would support a full size ATX PSU and most modern GPUs. Personly I like the SilverStone FT03 mini case but it is limited to a 10"/ 25,4 cm GPU (max. GeForce 760 or older GeForce 680). Let's hope the GeForce 800 series (Maxwell) will be shorter. Yes but most Mini-ITX cases that fit a full size PSU & GPU are very big compared to the only compontents that you need (PSU, GPU & Thunderbolt board). So a custom enclosure that fits on our desk would be much nicer. I definitely agree an official solution would be most beneficial. It's unfortunate that there doesn't seem to be a lot concrete information that we should expect any of these any time soon. I like the SilverStone FT03 solution, however, the price point is far beyond the $45 for the other ITX case. I am looking for something at the bare minimum price and an ITX case like I showed seems like a better solution than just having the components lying around in my specific case. Plus the case comes with 2 fans installed which is a great addition. AKiTiO ($199) + 16x Powered Riser (~$10) + PSU (~$30) + ITX Case ($45) = ~$284 USD for a Thunderbolt 2 eGPU setup with enclosure (minus the GPU of course) seems like a phenomenal deal for those on a budget. If I can get some solid confirmation the AKiTiO is functionally sound for eGPUs at that price, I will be doing this next month. Second option is the ThunderTek chassis, but since I have Thunderbolt2 support, it'd be great to make use of that. Amazon US doesn't accept an European address. Akitio forwarded my message to their European distributor MAG GmbH. But they haven't even received a demo unit and have no idea when the product will be available in Europe. I just checked it out as well and I see that only certain items are available to ship internationally. Unfortunately the AKiTiO is not one of them.